Promotions are sales that occur across your store and require no user interaction by the customer to redeem. For example, you run a summer special, select a group of products, and offer it at a 10% discount. All users will see the sale all of the time during that time period. Users do not need to enter a coupon code to redeem. The discounts will appear on the products themselves before the user even places the item in the cart. Step One: Simply add a new promotion name, start and ending date, and whether you wish to limit the user of this promotion to a customer account and the number of times. Price/Percentage off a product or group of products – This promotional type allows you to take a dollar value or percentage off a specific group or product. Price/Percentage off when certain dollar value reached – This promotion allows a dollar value or percentage off discount to the user based on the cart total. If they reach this value and cross it, they get the discount. Price/Percentage off when certain number items in cart – This promotion allows you to enter a quantity value and then apply it to a category or certain product. The discount based on price/percentage will then be take off the cart when this quantity threshold is reached. Shipping discount when certain dollar value reached – This promotion allows a shipping discount to the user based on the cart total. If the shopping cart reaches this value and crosses it, they get the shipping discount. Free Shipping on Selected Products – This promotion allows you to offer a free shipping promotion during checkout. With live API systems, this Free Shipping will appear before all other shipping types. If you use Static Rates, it will appear before your other static shipping rates as a selection. IF you only apply it to specific products, it will apply to the order IF that product is found in the cart. 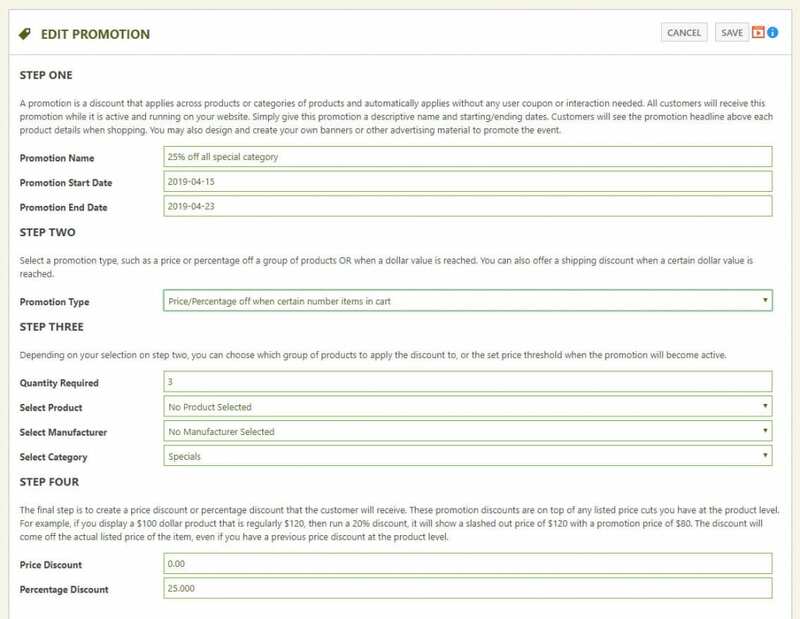 Step Three: Apply this promotion to a group of products based on manufacturer, category, or a single product. Here you can specifically target a group of products. Often it is easiest to create a specific group of products just for this promotion. Step Four: Enter the price OR percentage discount (one or the other) for this discount. You can and should only enter one or the other values here. Step four is removed if you have a simple Free Shipping promotion.